The other week a local fabric shop gave me a couple of meters of this lovely citrus fabric in exchange for having pics of my results to show off on their FB page. (as I checked the link worked I saw some fab new dalia patterned cotton just in…. look away now!) But anyway, fabric in exchange for pics is a win-win situation in my book. I even have a glass necklace of oranges bought on a long ago trip to Venice to accessorise with. But now I cannot get that damn song out of my head. I haven’t sewn from a vintage pattern for a while. This was nice quick dress to do and helps justify my growing pattern collection, sort of. Yeah ok really not at all but I do better with my fabric stash… that is a fairly constant one fabric in to one out. Vintage patterns are roughly ten patterns bought to one used. Not so good. Thankfully the often silly prices of vintage patterns do help me keep a check on myself. Catherine of ‘The Makings of an Urban Rustic’ has recently been making herself some pretty full skirted summer dresses and they reminded me just how much I like this silhouette. And even though, baby, it is still really cold outside some new summer clothes seem the way to sew. I’ve been trotting out the same ol’ dresses for a few years now as the English summers make their half-hearted appearance. Now jumping back to the 1940’s, the second version of the Bloggin Blues dress is underway (pattern corrected, copied out and in the post tomorrow Villblomsten 🙂 ) This time in a rayon challis print. It’s very different than my original effort isn’t it?! At first I was seriously not loving it & had to leave it for a bit. The fabric is very limp and the print is a little too reminiscent of a flannelette nightgown I once had. But I soldiered on as I had to at least check the pattern was in good working order. But then styled with a red buckle, a scrap of red velvet for buttons, a red handbag and visions of a dash of red lipstick on the day- and no miss but a hit! It needs its back belt, red buttons and loops, shoulder pads, a hem and she’s done. It hasn’t quite got the punch of the first BB dress but is very wearable and I’m sure I will. Here are three highlights from the big pile of fabrics I’m determined to use soon: the hummingbird fabric, quite new, is destined to become another full skirted sundress. That’s easy. The embroidered raspberry chambray has been brought out 5 years running but I still haven’t used it- a bit of an eyeful colourwise?. Maybe the slim skirted version of the 60’s style I just sewed or possibly just a shirt. Which ever, it’s crying out to be worn someplace sunny to keep it from looking too garish… so not surprising if it ends up back in the fabric cupboard for yet another year. And then there is the crazy daisy punched linen I bought a couple of years ago. That’s gonna be a tricky one. Not least because it’s white so a guaranteed Pimms spillage magnet. Also the construction techniques will be difficult regardless of the style it gets used for. But when I’m next up for a challenge it’s the fabric I’ll reach for. Love the oranges & lemons fabric & pattern! I borrow 2 of you pictures – is that ok ? Yes that is fine about the pictures and you are most welcome! Both dresses are adorable! I really like the rayon challis floral print dress. I love anything with gathers across the bust. I think it’s a really flattering look. Adore these dresses! I’m a sucker for fruit prints, the citrus dress reminds me of the last S/S Stella Mccartney collection. Oooo yes. I spotted the humming bird fabric while I was online window shopping the other day… I like your idea for a sun dress. Gorgeous, gorgeous gorgeous! I have that vintage pattern you have pictured! I’ve now made all 3 styles from it, it’s a good’un! Thank you 🙂 I’d love to see the jacket and slim dress made up, are there pictures on your blog? Love the citrus dress, we sang an abridged version over here in Oz – I had no idea there more bells than just St Clemens. The head chopping was a big hit with the 3-6 crowd. What is it about morbid nursery rhymes? Both dresses are awesome and I’m looking forward to what becomes of the hummingbirds, it looks very Horrockses to me. What an inspiring post! All bright and cheery. I love the oranges and lemons dress. And the version of the BB dress is gorgeous! It’s all just fogging up my mind. I can’t remember what I’ve been working on. All I can think of is I need to buy summery fabrics! Must make cute dresses! So envious of your fabric. Love it! love the material hope its still around for next summer. We are finally getting ready for our winter. Absolutely outstanding sewing work . Fabric, and pattern choices are perfection. It’s altogether so very lovely. Love the oranges and lemons dress! And I remember singing the song in the infants- and I’m from way up north! And just when will it be Pimms o’clock again…?! It’s Easter and “Spring”, but not quite the mood yet, is it?! I love the Orange and Lemons dress.It looks so fresh and summery and elegant.Thank you for the mention…and although my pattern is modern when made up I think they are definitely more of a 60’s rather than a 50’s feel to them…but mine look so dowdy next to yours!I can’t wait for the summer to turn up so that I can wear them…I am determined to even if I have to keep my woolly tights on!! I love the blue dress too.I have some 40’s patterns I want to make up still but just can’t find the right fabric. It is hard to find fabrics for 40’s styles isn’t it! I like crepes but don’t come across nice synthetic ones all that often. Wool and silk crepes work well of course but cost a lot. The blue print challis was an accidental (and cheap) find from C&H fabrics. Somehow being a pattern cutter hasn’t stopped me from buying Vintage patterns… rather wish it did but at least I can claim them as ‘research materials’ 🙂 I find it relaxing to just get one out from time to time to sew from rather than always doing my own. Thanks I now have an earworm of “Oranges and Lemons!” and I’m Scottish!? Still well worth it to see that lovely dress, totally Sandra Dee. I can see it with a little yellow cardi over the shoulders. I love, love the BB dress, its the silhouette, gets me every time, and that shirring. I also love the fabric on this, but then I never had a flannelette nightie like it – guaranteed I would pick it out in store. Nice stash btw. That raspberry chambray, I see as a Summer swing jacket worn over a plain pencil skirt or cropped pants. I will be interested to see what you make with it. My three year old and I sing that in the car sometimes, I live by the Great Bell of Bow and am currently working within chimes reach of Shoreditch. I love spotting the bells when travelling about this part of London. Rather aptly for your dress, it was Oranges & Lemons Day last week on 21st. Have no idea what the day represents though, I should google it! But I do love the fabric and the end result, its stunning and makes me feel summery looking at it! 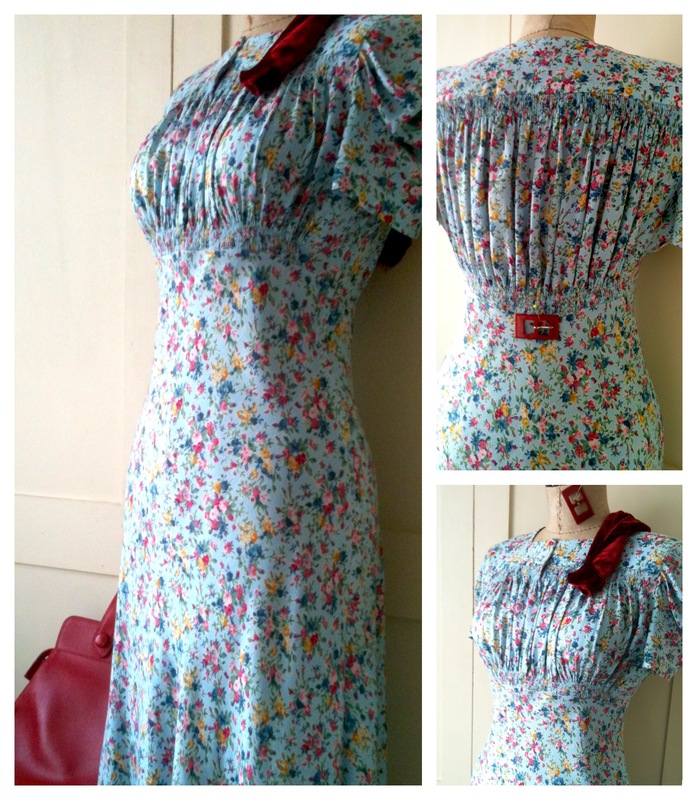 And yet again, I love and would love to wear the forties dress, it really is a gorgeous pattern! So it was, the 3rd thursday in March! I have never heard of that day before so just looked it up. And you maybe then have even heard St. Clement’s bells chime the tune to the song then as one link said they do? There even is an old Pathé clip of some bemused children biting into lemons on the day!